Since many Windows applications can and will automatically save passwords, it's sometimes annoying when after so much time has passed since you actually need to type in your password, you've actually forgotten what your password was! 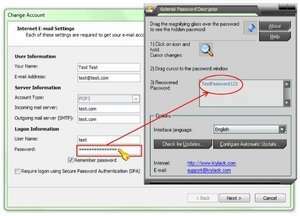 That issue can be overcome with Asterisk Password Decrypter. While it doesn't actually decrypt anything as the name might suggest, Asterisk Password Decrypter can reveal what the password is behind the stars (or asterisks) you see on your screen instead of a plain text password. This password recovery program can reveal many hidden passwords in Windows including those for Microsoft programs like those from the Office Suite (Outlook password recovery), FTP clients like WS_FTP or FileZilla and some Internet browsers including special support for Internet Explorer. Asterisk Password Decryptor 3.31 is a shareware program and can be used as a demo to try the software until the free trial period has ended. A full version of the program is available after the trial period ends. For security reasons, you should also check out the Asterisk Password Decryptor download at LO4D.com which includes virus and malware tests. Additional screenshots of this application download may be available, too.